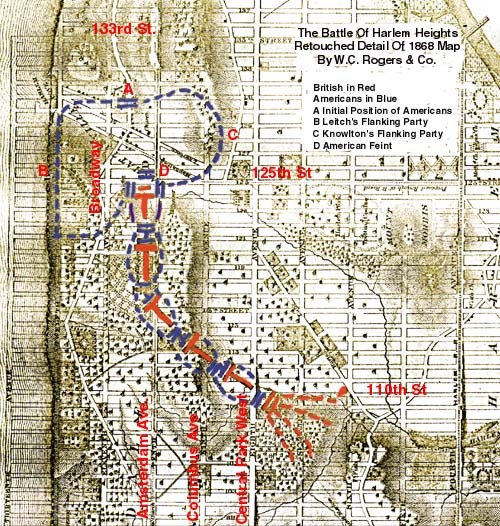 The Battle of Harlem Heights, though a minor engagement, showed the American troops they could win in battle after the loss on Long Island and the embarrassment of Kip's Bay. On Sept. 16, 1776, the Americans still controlled northern Manhattan after the British had captured the sourthern portion of the Island. American skirmishers met British troops near 106th Street and Broadway. The Americans held their position under fire, but began to retreat northward toward the main American lines as the number of British troops involved began to rise. The fighting ranged north to about 125th Street before Washington decided to send troops forward in two flanking maneuvers, one under Major Leitch and the other under Colonel Knowlton. A third force of Americans made a feint to attack the British in their front. Although the Americans attacked before the British were surrounded and Leitch and Knowlton were both mortally wounded, the British found themselves attacked on three sides and began their retreat. The number of troops grew to nearly 5,000 on each side as the British were pushed back to what is now 106th Street. Washington called off the attack after six hours because the Americans were not ready for a general engagement with the full British army. 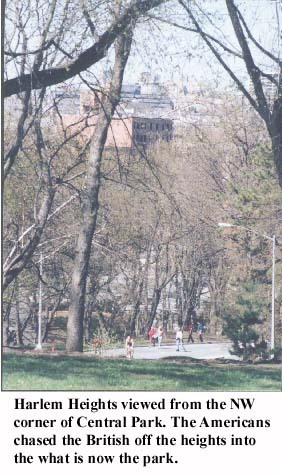 Much of the battle took place near 120th Street between Broadway and Riverside Drive, just west of Columbia University. "This little advantage has inspired our troops prodigiously," wrote Washington. "They find it only requires resolution and good officers to make an enemy give way." 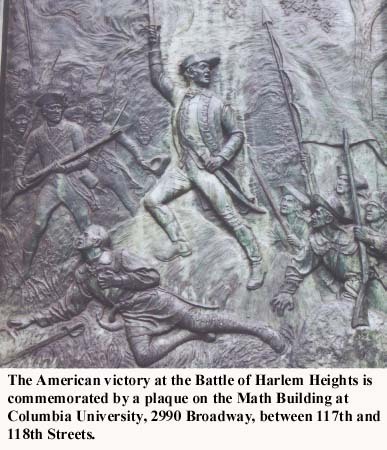 Some historians see Harlem Heights as a turning point in the American efforts to create an effective army. Address: West side, 110th Street to 125th Street, plaque at 2990 Broadway, between 117th and 118th Streets. Transportation: Take the 1 or 9 to 116th Street. Walk north on Broadway to plaque on east side of Broadway between 117th and 118th Streets. (From Morris Mansion, catch 1 or 9 downtown at 157th Street and Broadway).